Good day, lovelies! A very quick post for you all while I'm in Florida on vacation! Because I'm dipping my feet in the pool, I thought a shimmery blue would be perfect for this post. I received Julep Marion, named for Academy Award winning actress, Marion Cotillard, in my February Box! Right now, you can receive your first Julep Maven box for FREE by clicking here and entering the code FREEBOX. All you pay is $3.50 for shipping. A $20 box for just $3.50? Sounds like a steal to me! 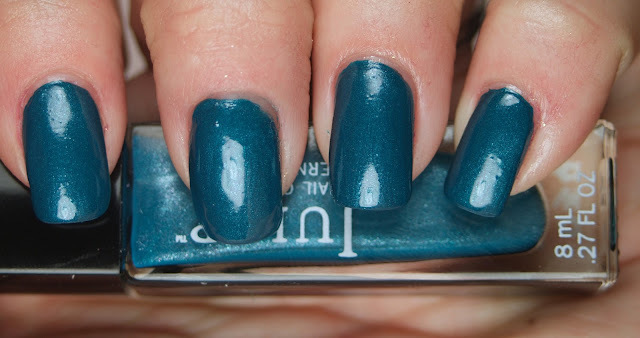 Julep Marion is a rich teal nail polish with aquamarine shimmer. The above is with two coats. I love that is has such depth and dimension to it. It's very glowy, in a way. So what do you think of Julep Marion? Are you a maven? Are you planning on becoming one? Pretty! Ive never tried julep before. Is the box a one time commitment or is it a subscription? Can I unsubscribe after the $3.50 box if i sont like them?